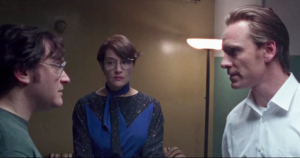 Steve Jobs is a film that functions with the well-oiled synchronization of an orchestra. Unlike many musical accompaniments, I felt it was led by a symphonic collaboration between duel conductors. Director Danny Boyle is as stylistic a filmmaker as any. His style is equally matched by screenwriter Aaron Sorkin. Rather than relying solely on his cinematic vision, Boyle’s direction is largely reserved. He creates the aura of watching a stage play but without it feeling confined or restricted. The film still functions as a cinematic experience. He occasionally inserts dream-like flourishes but he allows Sorkin’s script to drive the narrative. With both men working in sync with their figurative “players”, the end result is my favorite film of the year thus far. 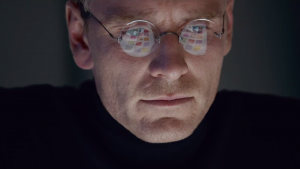 Structurally, Steve Jobs could very well pass as a stage play. Virtually all of the film is set within interior rooms and auditoriums. The three time periods in which the film is set play out like acts. All of them fit together as a singular piece but they’re all fascinating as individual chapters. Each act occurs minutes before an Apple product launch. 1984, the backdrop for act one, is right before Jobs unveils the Macintosh. Right away we see that Jobs is obsessive and critical about his technology. His work partner, Joanna Hoffman (Kate Winslet), insists that Jobs needs to create stability with people and not just his technological advances. He’s balancing his ex-girlfriend’s (Katherine Waterston) demands that he take responsibility of her daughter, even though he denies being the father. Hoffman’s recommendation of balance also includes Steve Wozniak (Seth Rogen), who is merely looking for acknowledgment as a key member of the Apple team. These relationships compose the core of Steve Jobs. On the surface, there’s a lot of ground to cover within the first act alone. It’s a commendable achievement that there’s never a moment where it feels self-serving or overly ambitious. Boyle and Sorkin helps maintain a consistent pace without relying too much on technical jargon or sappy melodrama. All of the conversations are packed with Sorkin’s trademark kinetic flow. The words move as much as the actors do because many occur while walking back and forth between corridors and dressing rooms. It’s hard to believe that the real people actually spoke this eloquently and this erratic. Then again, I’m sure real people don’t talk like characters written by Tennessee Williams either. Sorkin’s screenplays demand actors of superb ability and conviction. While the cast is relatively small, each actor brings something great to the screen each time they appear. All of the relationships between Jobs and others possess distinct traits and connections. Jobs and Wozniak reminded me of a brotherly bond. Wozniak’s almost like a younger brother seeking approval from his condescending older brother. Rogen provides earnest pathos and warmth to Wozniak as a contrast to Jobs’ cold and blunt attitude. In a similar manner, Jobs and Apple CEO John Sculley (Jeff Daniels) have a father/son dichotomy to their relationship. Jobs and Hoffman reminded me of close work partners who only sought professionalism with one another. 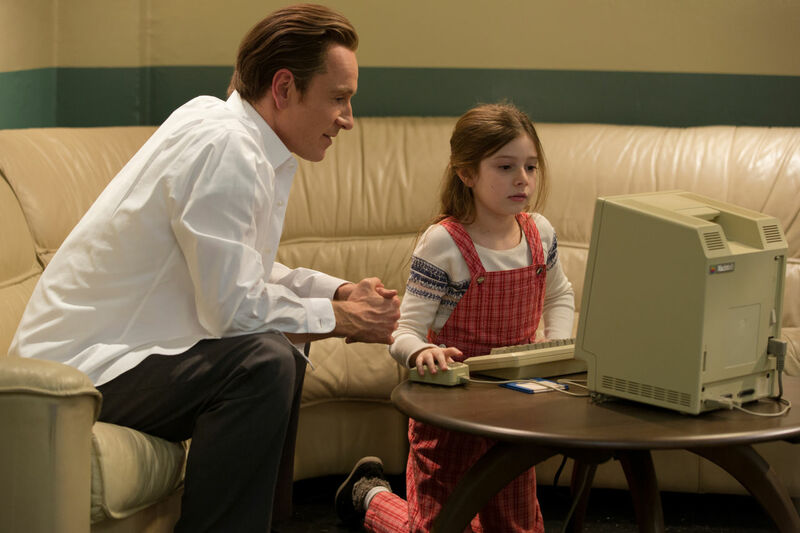 It speaks to Boyle and Sorkin that these relationships feel as genuine as the one we see between Jobs and his biological daughter throughout the film. This brings me to Michael Fassbender’s performance in the title role. It’s been frequently stated that he bears little resemblance to his real life counterpart. I am glad that the filmmakers did not feel the need to bury Fassbender under makeup and just let the performance speak for itself. I never cared what his physical appearance was because he became Steve Jobs in a more challenging way. He embodies the internal composition of Jobs. His drive, his determination, and his commanding forcefulness are all on display. He doesn’t care what others think of him and never holds back his true feelings. Most importantly, Fassbender paints Steve Jobs as a human being with extremes. These extremes forbid labeling him as a hero or a villain. Much like what Sorkin did in The Social Network, Jobs is never redeemed or made to apologize for his actions. Given the subject manner and involvement of Sorkin, comparisons to The Social Network were inevitable. Both movies center on technologically gifted men who struggled with interpersonal communication. That’s about where the comparisons should end. Boyle and team have crafted a masterful film about an actual person without relying on the traditional manner of biopic storytelling. Instead of telling a standard life story, Boyle and Sorkin chose to pinpoint and explore parts of Jobs’ life. I’m sure there are fictionalized elements within but that doesn’t distract from my overwhelming positivity. Boyle and Sorkin don’t go out of their way to educate about the specifics. Other mediums have already explored Jobs in full detail. 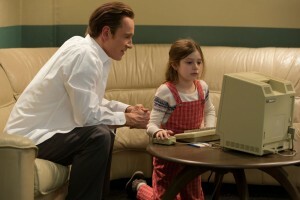 Steve Jobs captures pivotal moments and it’s as engrossing a film experience as any I’ve seen all year. Will Aaron Sorkin Get Lucky with Molly’s Game?